number will not be charged. Please note that in the Partially Blocked category, you will not receive any commercial communications in the form of voice calls. Once you have registered, you should get, subject to the correctness of your request, a unique registration number by SMS within 24 hours of registration. Please keep this number carefully as this will serve as a reference for your registration of preference. Your request for registration on the National Customer Preference Register will be given effect to in 7 days counted from the date of request for such registration to the access provider. If you are already registered in the National Do Not Call Registry (NDNC) you do not have to re-register; your registration will continue under the ‘Fully Blocked’ category. You may make a change in your preference at any point of time after expiry of three months from the date of registration or three months from the date of last change request. The service provider will confirm the registration of such a request within 24 hours to you through SMS, subject to the correctness of request. In case of errors in request, access provider will advise you to make a fresh request. No amount shall be charged from you for registration or change of preference or de-registration. In case you receive an unsolicited commercial communication after expiry of seven days from the date of your registration in the Provider Customer Preference Register, you may make a complaint to your Access Provider, through voice call or SMS. The complaint has to be registered from the telephone number on which the unsolicited commercial communication has been received. Your complaint should be made within three days of receipt of the unsolicited commercial communication. Detailed procedure to register the preference in National Customer Preference Register, change in registered preference, de-registration and registration of complaint is given on website http://www.nccptrai.gov.in/nccpregistry/, tab ‘Information to customers’. India has been ranked 67, way below neighbouring countries like China and Pakistan, in a new global hunger index by the International Food Policy Research Institute. India is at a crucial turning point with a few successes and some failures. Persistent inequalities, ineffective delivery of public services, weak accountability systems and gaps in the implementation of pro-poor policies are the major bottlenecks to progress. State and Central Government are taking actions to reduce the hunger count at their own speed.Youngsters,NGO’s and volunteers have to contribute for the cause.Uganda,Namibia and Nigeria are ranked ahead of India.Our entire country should wake up on the alarming issue. With just five years to the 2015 deadline for achieving the millenium development goals, the country as a whole will not be on track for a majority of the targets related to poverty, hunger, health, gender equality and environmental sustainability unless concerted national efforts are made by government and all sections of civil-society working in tandem. This year’s hunger figure marked a nearly 10 per cent decline from the 2009 level, with the reduction concentrated in Asia, where 80 million fewer people are estimated to be going hungry this year. 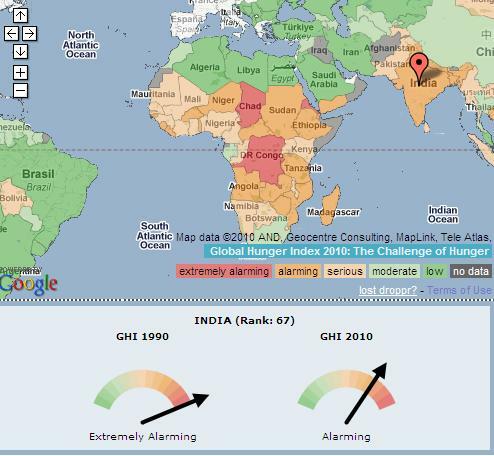 According to the 2009 Global Hunger Index, India ranked 65 out of 88 countries. The index rated 84 countries on the basis of three leading indicators — prevalence of child malnutrition, rate of child mortality, and the proportion of people who are calorie deficient. China is rated much ahead of India at the ninth place. The 2010 Global Hunger Index, released by the International Food Policy Research Institute in association with a German group Concern Worldwide and Welthungerhilfe, ranks countries on a 100 point scale, with 0 being the best score (‘no hunger’) and 100 being the worst, though neither of these extremes is achieved in practice. The higher the score, the worse the food situation of a country. Values less than 4.9 reflect ‘low hunger’, values between 5 and 9.9 reflect ‘moderate hunger’, values between 10 and 19.9 indicate a ‘serious’, values between 20 and 29.9 are ‘alarming’, and values exceeding 30 are ‘extremely alarming’ hunger problem.